When western Virginians separated from the Commonwealth of Virginia to form West Virginia, the distinctive action reflected five decades of deep dissatisfaction with the Commonwealth’s regressive constitution and the governmental procedures that protected slavery. The westerners’ creation of a new state was revolutionary in the context of U. S. statecraft. New constitutional approaches and laws addressed past wrongs and the realities of war. Grave external and internal forces, sometimes armed, opposed West Virginia’s creation and establishment of civil order and state institutions. The state-makers resorted to statutory and constitutional measures, often arbitrarily applied, to preserve the state, their legislation, and their political position. Some enactments removed state citizenship and the franchise from the disloyal; enabled the seizure of rebel property; required oaths of past loyalty for voting, suing in courts, and for the practice of professions such as teaching, law, and other pursuits; and established a stringent registration system administered by the loyal to prospective voters. Returning Confederates, along with stay-at-home sympathizers, and opponents of national policies organized a political and legal assault that succeeded. 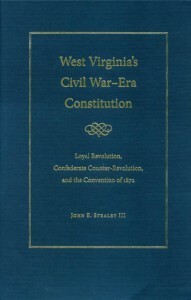 Rejecting the hackneyed and inaccurate concept of “Reconstruction” as it reflects rebel assertions, author John Stealey reinterprets West Virginia’s post–Civil War constitutional and political development within the counter-revolutionary framework. The Democratic/Conservative opponents of the Republican state-makers rode to power after seven years on the issues of race and the existence of wartime and postwar statutory and constitutional enactments that assured temporary state security and political dominance of the loyal. The torturous and complicated path to counter-revolutionary success and change occurred within the context of national events. A primary counter-revolutionary goal was drafting a new constitution to replace the state-makers’ original of 1861–1863. The Constitutional Convention of 1872 was the culmination of the quest for power. Stealey presents for the first time a comprehensive account of the debates and acts of the constitutional convention that reflected the Virginia and wartime experiences of delegates as well as the counter-revolutionary aims of the overwhelming Democratic/Conservative majority. This framework still serves as the Mountain State’s fundamental law. AuthorJohn E. Stealey III, distinguished professor emeritus of history at Shepherd University in West Virginia, is the author of numerous articles and essays about the Virginias and southern Appalachia. He has also written three previous books, which explore a vital antebellum extractive industry, internal commerce, and legal development. His most recent is Porte Crayon’s Mexico: David Hunter Strother’s Diaries in the Early Porfirian Era, 1879–1885 (The Kent State University Press, 2006). ReviewsHear a West Virginia Public Broadcasting interview with John Stealey. Read Tom Rodd’s Charleston Gazette review. Read a review on the Legal History Blog.